WEST LAFAYETTE, Ind. — Purdue Day at the Indiana State Fair on Aug. 12 will feature more than 50 tents and exhibits that include robotics demonstrations, an obstacle course from the new College of Health and Human Sciences, and a spelling bee. 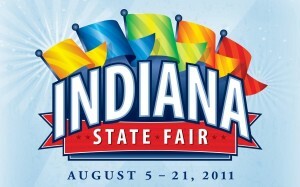 Purdue Day exhibits that will line State Fair Boulevard at the Indiana State Fairgrounds in Indianapolis will be open from 10 a.m. to 10 p.m.
Exhibits in the Pioneer Our Land Pavilion – sponsored by Purdue University Extension and the academic areas of agriculture, health and human sciences, and veterinary medicine – also will be open. These exhibits will remain in place throughout the fair, which begins Friday (Aug. 5) and runs through Aug. 21. Purdue Live! Stage performances will begin at 10:30 a.m. on Purdue Day. Highlights will include a robotics demonstration and performances by Purdue Musical Organizations, Purdue Twirlers and the Purdue Alumni Pep Band. Carrying out the fair’s “Year of the Soybean” theme, there will be “Jump for Soy” basketball contests on the Purdue Live! Stage. Details will be available at Purdue information tents at Gates 1A and 12. Events during the day include cricket spitting contests and cockroach races; a bugs, beetles and bees demonstration; a “Get Moving with HHS” obstacle course featuring the Purdue Twirlers and Department of Health and Kinesiology; and a spay/neuter animal surgery demonstration. The Purdue School of Veterinary of Medicine is partnering with the Indiana Veterinary Medical Association to provide surgical demonstrations at 11 a.m. and 2 p.m. at the Pioneer Hi-Bred Our Land Pavilion. The demonstrations also will be held at those times Aug. 13 and 14, Aug. 16, Aug. 18 and 19, and Aug. 21. A Purdue pep rally at 5:30 p.m. will feature Intercollegiate Athletics director Morgan Burke, the spirit squad, Purdue Alumni Pep Band and Purdue Pete.